There is reason why most (and I emphasize most) people agree that Apple (NASDAQ:AAPL) is one of the primary leaders – if not the leader of all the companies on the NASDAQ. I was just looking at the past month’s data in Google Finance on Apple shares versus the NASDAQ and saw that the NASDAQ was down 1.5% while Apple shares were up over 9% (again, 1 month data). Apple is what I would call a “disruptive” company. And what I mean is that Steve Jobs isn’t afraid to come out with something that the world has never seen before, or isn’t afraid to place large bets on leading technology. Apple does not really believe in coping other people and following “popular” popular trends. I see other large companies on the NASDAQ also as “distruptive” companies. Google for example, is highly disruptive in that they aren’t afraid to fail and break things. In fact, I believe that companies like Apple and Google see “broken” and “failure” as defining success. Wow – I kind of like the way that sounds – broken and failure define success! It’s so true of companies like Apple, which is why we see them as a leader in the NASDAQ. Apple also knows how to prepare for even more disruption in the market place. Just look at the all the controversy and soap opera level drama that is circulating around the iPhone 4G. I mean, we have federal agents busting down the doors of bloggers who paid $5000 for an iPhone 4G proto-type… Tom Clancy would be jealous of these story lines! And yet, this disruption and “broken’ness” in fact is what allows Apple to continue leading in innovation, technology, and ultimately it shows in Apple share prices. 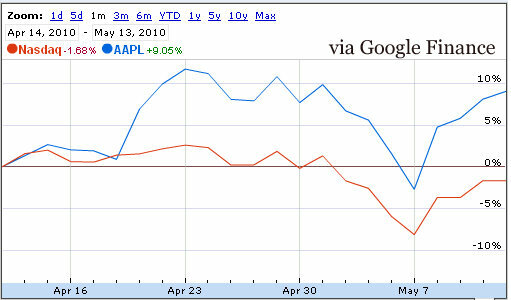 What do you think about Apple and their leadership in the NASDAQ?